avast! 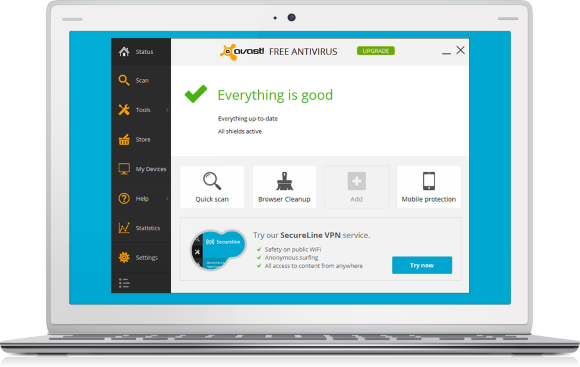 Free Antivirus was nominated by Lifehacker users as one of the best desktop applications. Lifehacker is a well-known site for its "Tips, tricks, and downloads for getting things done." When the subject is to get protected and install an antivirus, they picked up avast! Free Antivirus and, now, last Sunday, avast! was picked again as one of the Top 5. "It's our pick as the best...it's fast, lightweight,...", says Lifehacker. When expert people say something is the best, it is always due to a combination of factors and it varies (a lot!) among users. Lifehacker asked their users to point out where avast! excels and what they miss in the competition. They say they are confident of choosing avast! due to a lot of points. Users commented on the high level of usability and that it fits for common users, but doesn't lack advanced settings for the geeky ones. If you want it, avast! has a high level of customization, fitting well for all needs, from gamers to your grandma! "A fairly simple interface from which you can scan your computer, see statistics, update definitions, and more." Voters appreciate avast's many features: Scans files, email, URLs, P2P programs, and more for malware. Automatic updates happen as soon as the virus database or program changes. In fact, the streaming updates are released each 4 minutes! "It updates quietly in the background without fuss." "Silent mode where you can disable any and all notifications and warnings to keep performance slim and trim." "Others highlighted specific features, like avast! 's screensaver scan, where the application only kicks in when you're away from the computer or the system is idle." "avast! may be simpler and lighter weight than most other programs out there"
"The app itself is relatively resource light — you may not even notice it's there". A few users highlighted the fact that avast! is cross-platform, and available for multiple operating systems. LifeHacker says, "We personally don't think paid antivirus are necessary in a home setting, especially if you use good browsing habits." And the #1 reason people choose avast! Free Antivirus? "Best of all, it's completely free." What are you waiting for? Install these avast! security products on your devices.